Currently working on locking down book signings in the Atlanta area. Well, it’s not Thanksgiving anymore but it’s time to announce the winner of the FREE signed copies of The Broken Scale and The Clash of Land and Sea. I was going over the comments and the one that stood out to me was from Amanda Hougas. Thank you for your continued support and congratulations on your two new books! Everyone continue to be on the look out I am going to do one more giveaway before the end of the year and this one is going to be a big one…. Really big. Oh, its time. You know what time it is? Yes you do. Book four is coming along smashingly and I think its time to, ya know, let you in on a little bit of what's going on. First off, the title. 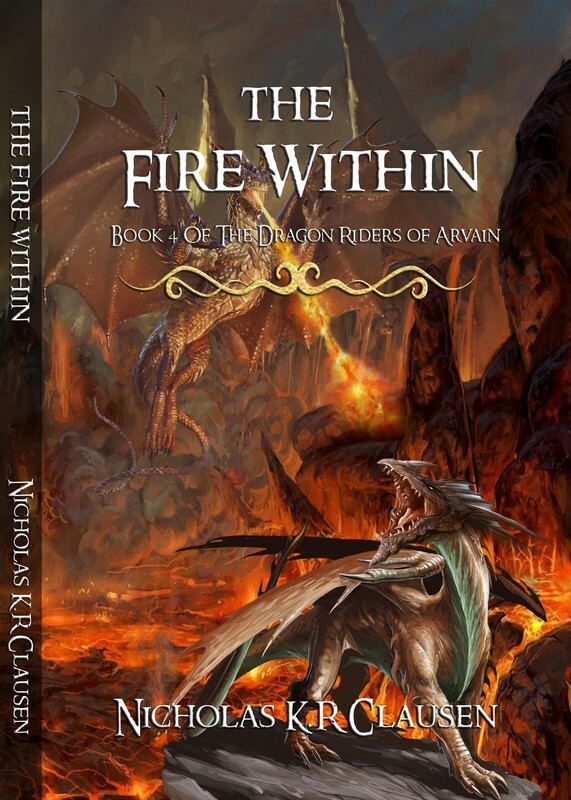 The fourth, and final instalment in the Dragon Riders of Arvain Saga is...… The Fire Within. I am excited. I hope you guys like it and guess what else, we have a cover. Did I Lose Track of Time? If you have read the post prior to this one then you already know that we have a working title for book three, if you haven’t read it yet then please check it out. As for where is the third book? The answer is simple, it’s here in my house. To be more exact it’s saved on my PC and printed in a black binder on the shelf behind me. I assume though you want to know when it’s going to be released? ​That answer is not so easy. The novel is finished in the most basic sense of the word. I have the beginning the middle and the end and it is a beautiful arc but it's rusty and dirty and a little over weight. What happens now is I go through it for the second time and try my best to clean up my brain child before its time for pictures. After this pass through I will send it off to a fellow writer to have it looked over and then it's off to the editors. I would like to see it out around April of 2018 but that is just written in pencil at this point. ​A Song of Ice and Fire.